Oh, so yummy!! These Gluten Free Black Forest Cheesecake Brownies were another of my entries for the Real Women of Philadelphia contest I entered lately, and it was ready to eat in 1 hour. 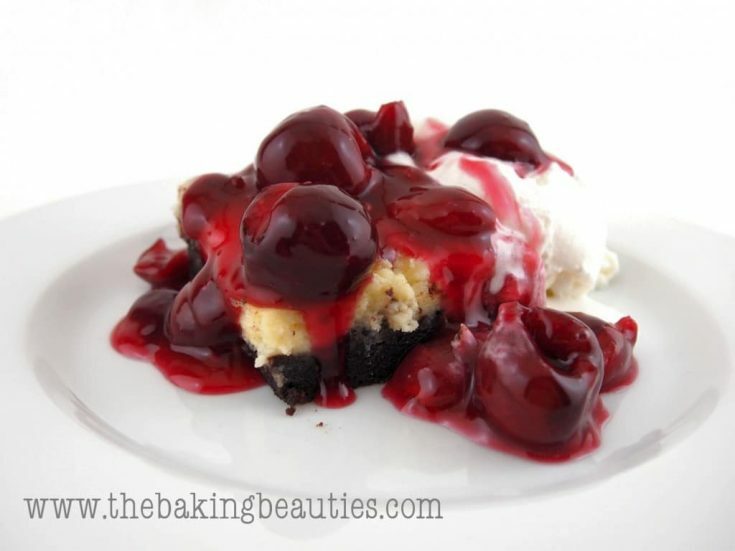 The dense brownie, topped with a sweet cream cheese layer, and then these beautiful big Bing cherries that were cooked into a pie filling…oh my goodness! Those Bing cherries were worth it all by themselves! The cake portion can easily be doubled and baked in a 9″x13″ pan, and the single recipe of the cherry pie filling will be enough for the 9×13-inch pan. Depending on how much cherry pie filling you want with your piece, you should have leftover when making the original recipe as written. These dark chocolate brownies are topped with a silky smooth layer of cream cheese, and the homemade cherry pie filling that tops it, brings this brownie over the top. Line an 8-inch square baking sheet with parchment paper. Set aside. In a small bowl, combine gluten-free flour, xanthan gum. Set aside. Stir together the melted butter and cocoa powder until blended. Set aside. In the bowl of a stand mixer fitted with a paddle attachment, mix the 2 eggs, brown sugar, and 1/2 cup white sugar until smooth. Add the vanilla and chocolate mixture and mix until well blended. Mix in the gluten-free flour mix and espresso powder. Stir until smooth. Pour into prepared baking pan and smooth the top with a spatula. Set aside. In a large mixing bowl, use a hand mixer to combine the softened cream cheese, 1/3 cup sugar, egg yolk and brandy extract until smooth. Spoon mixture over the brownie mixture, covering the top of the brownies with the cream cheese mixture, and trying to NOT mix it into the brownie mixture. Bake in preheated oven for 25-30 minutes. Let cool on cooling rack for 10 minutes before removing from baking pan. Let sit for at least another 10 minutes before cutting. While the brownies are baking, we will make the cherry pie filling. In a large sauce pan, combine 2/3 cup sugar and cornstarch. Stir to blend. Add the water and lemon juice, and whisk until smooth. Stir in the pitted Bing cherries. Cook, stirring constantly, over a medium-high heat until the mixture comes to a boil. Lower to heat to Low, and continue cooking, stirring occasionally, for another 10 minutes. Remove from heat stir in almond extract. Refrigerate until ready to serve. To serve, cut brownies into 9 even pieces, top each piece with the cherry pie filling, and a dollop of whipped cream (if desired). 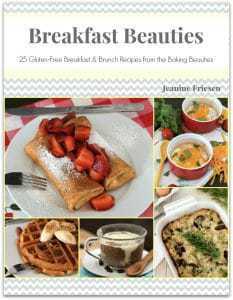 Gluten-free Flour blend consists of 4 cups superfine brown rice flour, 1 1/3 cups potato starch (not flour), 2/3 cup tapioca starch. Combine all ingredients in a large zipper-top bag. Shake until well blended. Oh Jeanine..that photo should not be allowed:) Now I want one of those brownies!! I agree with Betty – that photo should not have been allowed. Time to wipe my keyboard now. Amazing. These are delicious!! Definitely go for the 9×13 version 🙂 I especially love the cherries. They would make a great cherry pie!